Enhancing efficiency and increasing the usage of renewable energy sources are key elements of the revolution in energy policy and thereby climate protection. eBus-Cluster provides solutions which enable manufacturers to clearly and measurably enhance the energy efficiency of their vehicles. To achieve this, self-regulating, artificially intelligent systems for thermal management are developed which adjust the energy need in an optimum, flexible way, and guide the interaction of relevant parameters. AURORA-Group — global manufacturer of HVAC systems and components, contributing expertise by providing the Cluster an innovative HVAC system featuring a lightweight, modular and compact construction. Core element of this new system is the industry-leading HEAVAC heating pump, that provides hot and cold water at the same time. Thanks to a compact refrigerant circuit, refrigerant need is significantly reduced compared to standard heating systems. The heating capacity of AURORA convectors is supported by an AURORA PUMA axial fan heater. The entire HVAC-system is laid out in 5-zones and can communicate via a CAN Bus connection, controlled by an AURORA Aranea controller which can be easily operated via HMI Access. By implementing smart sensors, temperature, pressure, air distribution, etc. are controlled fully-automatically. With its newly developed SPEEDLITE compressor, the BITZER Group – world’s largest independent manufacturer of refrigeration compressors – makes a major contribution to the success of the cluster. Both durable and extremely compact, the semi-hermetic BITZER scroll compressor equipped with an integrated frequency converter is optimized for both mobile applications and offering maximum efficiency at both full-loads and partial-loads. Integrated into the comprehensive system concept of the eBus-Cluster, BITZER SPEEDLITE compressors allow the application of ‘green refrigerants’ and thereby year-round efficient and sustainable thermal management. The products of S.M.A- Metalltechnik made in Backnang, Swabia – can be found in many products of leading German and European manufacturers of cars and commercial vehicles. In eBus-Cluster the efficiency of the AURORA-HEAVAC heating pump is improved by the installation of an innovative Pipe-in-Pipe heat exchanger within coolant circuit. Ultimately, this means less energy consumption and therefore a reduction of CO2 in the atmosphere in summer for generating cold as well as in winter for producing heat for the passenger compartment. 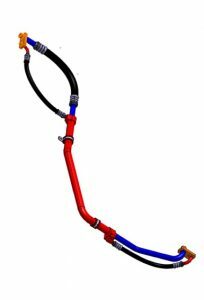 High-density joining techniques and refrigerant hoses prevent leakage of cooling agents from the system, and support stopping the reduction of O-Zone in the earth’s atmosphere. CELLOFOAM is a recognized specialist in the field of sound and heat insulation as well as in sealing products for both industrial and technical applications. Here its focus are fireproof materials for busses and rail vehicles. CELLOFOAM supplies the smart heating panels with integrated phase-change materials, that are installed in the sidewall paneling of the test carrier ColumBus. At low-energy, these emit constant heat, enable exact heat distribution, improve heat storage, and minimize the loss of heat from opening doors. Thanks to partial, adjustable sensor recognition, only the areas where passengers are either sitting or standing are heated. Via the IoT, this data is then processed and transmitted to the climate control system. Yet another important aspect for enhancing the energy efficiency of each vehicle is the use of a more efficient insulation. 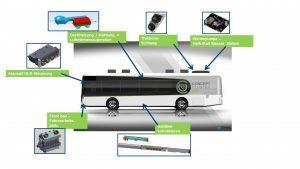 It’s here that CELLOFOAM delivers competence and expertise to the eBus-Cluster: innovative, field-tested pipe insulation from the product line Cello-Pipe Insulation. 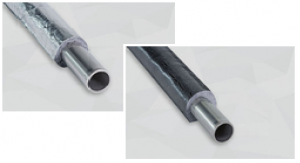 These insulation pipes are made of a durable marbled charcoal polyester fleece. Cello-Pipe Insulation is water- and oil-repellent and laminated with aluminum or polyester foils. Thus, the loss of heat or cooling energy is minimized to ensure maximum comfort. Schunk Carbon Technology is the largest division of Schunk Group and world-wide leading in development and production of materials, composites and technical ceramics. 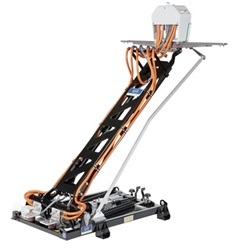 As an engaged partner in the eBus-Cluster, Schunk enables new charging infrastructure with its innovative, roof-mounted SLS 102 Pantograph which can be adjusted to fit all common charging strategies. The “Bottom-Up” system integrated in eBus-Cluster is a 4-pole design and corresponds with CCS-Mode 4 communication, designed with anticipatory contacts. Contact between the charging infrastructure and the vehicle is accomplished fully automatically and can easily compensate for tolerances of parking or kneeling functions. When pulse charging, the vehicle is fully charged within seconds. 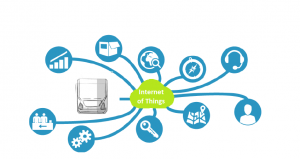 To connect all data within the IoT, the eBus-Cluster can rely on the competencies of the Fraunhofer Institute for Transportation and Infrastructure Systems IVI, Dresden, which moves forward the fields of automotive engineering and drive technology. The software solution developed by Fraunhofer IVI stores all data provided by the vehicle (i.e. door openings, occupancy, interior temperature, etc.) and data of the integration heating, ventilation, and air-conditioning system (pressures, COP values, etc.). These data points are combined with relevant data from the internet (i.e. weather forecasts and travel route profiles) as well as system processes. Even a continuous learning process enables the artificial-intelligence which guides the air-conditioning a step beyond what was previously achieved. For this data (i.e. from the web), historically measured and recorded data are combined and compared with actual data as well as the anticipated influences on passengers. Results are stored to their respective systems. Thus, optimizing the energy supply to the vehicle by adjusting interior temperatures to the external weather, occupancy, etc.